· Equipped with 0.3MP HD Camera: WIFI FPV Streaming in real time, to capture and record every memorable moment. · Fresh professional action of the 360-degree 3D flight and two subversion. The light color design of the LED, you can fly freely in the dark night. · 6 axis gyro four helicopter flight, strong stability, can easily implement various flight movements, stronger wind resistance, easier to control. · The waterproof fairy is born! Your fall in the water due to bad operation will never petrify anymore. Simply turn off the throttle at once and pick up your helicopter in 5 hours. Be carefree and enjoy the FPV! · NOTE: The Drone can be waterproof, but does not support diving flight again. After dropping into water, please keep it dry then flying. Otherwise, it will affect metail parts and redeuced its life span. Main Features: Waterproof airframe with nice durability. Brand new over-current protection function: When the blades are subject to strong shock or forcibly stopped, the aircraft will start self-protection, immediately stop the engine roatation. With LED light, suitable for flying in the dark at night. 2.4GHz control system ensures the strong anti-interference performance and powerful signal. Can support IOS and Android System. One key rise/one key down: Quick, easy to beginners. After dropping into water, please keep it dry then flying. Otherwise, it will affect metail parts and redeuced its life span. 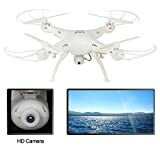 Specifications: Frequency: 2.4GHz Color: White Charging time: About 60 minutes Flight time: 7-8 minutes Remote distance: About 100 m Product size: 31 * 39 * 10CM (L * W * H) Package size: 33.5 * 12 * 23CM (L * W * H) Package weight: 0.75kg Battery Capacity: 3.7V 650mAh Lithium Battery Remote Control Battery: 4 * AA battery (NOT INCLUDED) Function: up/down, left/right, sideward fight , forward/backward, turn left/right, with gyro/flash lights,3d filp, one key return, one key rise/down Package listing: 1 * Waterproof Quadcopter 1 * Transmitter 4 * Spare Blades 4 * Protection frame 1 * USB charger 1 * Phone Holder 1 * HD Camrea 1 * Screwdriver 1 * Battery 1 * ManualPlease remember: 3.7V 650mAh battery Syma x5sw is game for the L15HW / L15 FW.In order to ensure the product brand new and can work properly, our staff will conduct product testing before shipment, so maybe the color box adhesive tape is opened.